Chaozhou (Chinese: ), alternatively transliterated Chiuchow, Chaochow, or Teochew is a city in eastern Guangdong province of the Peoples Republic of China. It borders Shantou to the south, Jieyang to the southwest, Meizhou to the northwest, the province of Fujian to the east, and the South China Sea to the southeast. It is administered as a prefecture-level city with a jurisdiction area of 3,110 square kilometres (1,200 sq mi) and a total population of 2,669,844. Along with Shantou and Jieyang, Chaozhou is part of the Chaoshan region. Chaozhou is located in the easternmost part of Guangdong Province, north of the coastal Shantou City. It is situated in the north of the delta of the Han River, which flows throughout the city. Chaozhou territory mountains, at the junction of Wuyishan have Yuemin system, macro mountains offshoot and tidal peaks Mei at the junction of the Lotus Mountain - Phoenix mountains. Phoenix bun for the eastern peak,1497 meters above sea level. The main rivers are the Huanggang River and the Han River. Han River from west to Southeast ramp through downtown Chaozhou, flows through Chaoan County, in the Chenghai River; Huanggang river flowing from north to south through the whole territory of Raoping, in the Huanggang town of Dongfeng dam into the sea. Two rivers provide abundant water resource for Chaozhou. Throughout the low-lying North High South, the northern mountains, the central hills, south of Han River alluvial plain. Hills account for 65% of the total area, mainly in Raoping and Northern Chaoan. North is a mountainous area suitable for tea cultivation and Shan, Tong, oak, Ke, tree growth; Hilly and low mountainous areas mainly bamboo, peach, plum, plum, olive, pineapple and tuber growth; Han River alluvial plain fertile land for rice, sweet potato, peanut, soybean, carrot, orange, peach, banana, Yang cultivation. History is" more mature rice, silkworm also received five place". In 214 BC, Chaozhou was an undeveloped and named part of Nanhai Commandery () of the Qin Dynasty. In 331 during the Eastern Han Dynasty, Haiyang () was established as a part of Dongguan Commandery (). Dongguan Commandery was renamed Yian Commandery () in 413. The commandery became a prefecture in 590 in the early Sui Dynasty; first as Xun Prefecture (, Xunzhou), then as Chao Prefecture (, Chaozhou) in the following year. In 1914, the Republic of China government combined Chao and Xun prefectures into Chaoxun Prefecture or Chaoxun Circuit (???). For a short while in the Sui and early Tang Dynasties, Haiyang District was called Yian District (). The name remained Haiyang until 1914, when it was renamed to Chaoan County () to avoid ambiguity with the Haiyang County, Shandong. The seat of the 1951 Guangdong Peoples Government was at Chaoan County; part of it was converted to Chaoan City in 1953 and later that year renamed Chaozhou City (county-level). In 1955, the provincial seat moved to Shantou. Chaozhou City was abolished five years later, and reestablished again in 1979. In 1983, the situation was reversed, with Chaoan abolished and made a part of Chaozhou City. Chaozhou was made a provincially administered city in January 1989, and a vice-prefecture-level city in January 1990. In December 1991, Chaozhou was further upgraded into its current statue of prefecture-level city. Chaozhou and the nearby cities of Shantou and Jieyang are collectively called Chaoshan. The name was used for the joint political-administrative area which encompassed the three cities from 1958 until 1983. For the next five years, Shantou City was a higher-level city containing Chaozhou and Jieyang within it. Currently, Chaozhou, Shantou and Jieyang are equal in status. 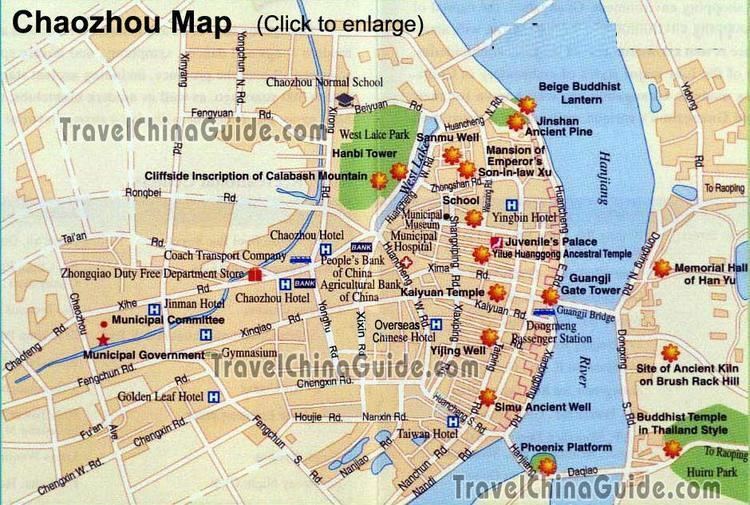 Chaozhou is famously known as one of the great cultural centres in the Lingnan region of China. Chaozhou culture is known worldwide as a unique part of world heritage. 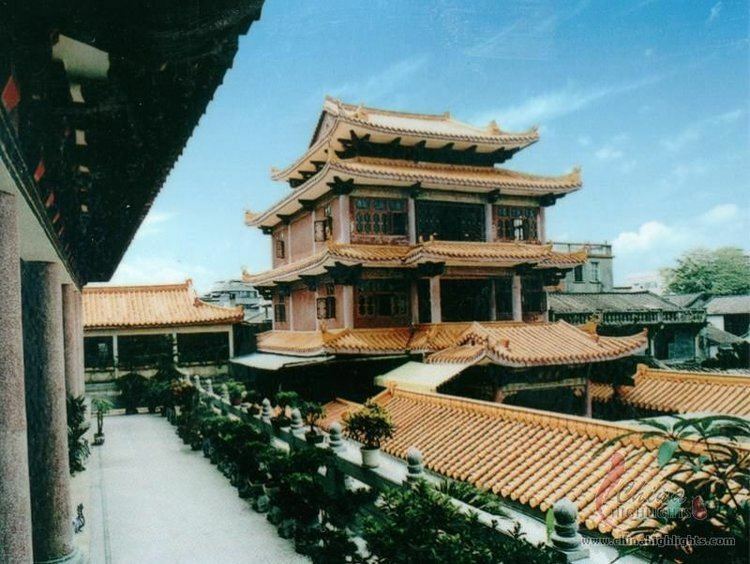 Throughout history, the Chaozhou region, was able to flourish and thrive as a prosperous cultural centre enabling the nourishing of a unique and distinctive character epitomized in the Chaozhou Dialect, Chaozhou opera, Chaozhou cuisine, Fenghuang Dancong tea, Chaozhou music, Chaozhou lion dance and Chaozhou embroidery. Chaozhou opera () is a traditional art form which has a history of more than 500 years and is now appreciated by 20 million Chaozhou natives in over 20 countries and regions. Based on the local folk dances and ballads, Chaozhou opera has formed its own style under the influence of Nanxi Opera. Nanxi is one of the oldest Chinese operas and originated in the Song Dynasty. Clowns and females are the most distinctive characters in a Chaozhou opera, and fan-playing and acrobatic skills are more prominent than in other types of performances. Gongfu tea, the espresso of Chinese teas with a formidable kick, which was first sipped in the Song Dynasty, is still flourishing and remains an important part of social etiquette in Chaozhou. Visitors to local families can be sure of at least one round of Ganghu tea. Though it tastes bitter when it first reaches the mouth, it is the lingering aftertaste that marks Ganghu tea. Drinking Ganghu tea is a process of aesthetics rather than a solution to thirst. At the local teahouse, tea service is often accompanied by Chaozhou music. String music, gong and drum music and the ancient music of set flutes are the traditional forms of Chaozhou music. Chaozhou string music is made up of mostly plucked and bowed string instruments, and on some occasions, wind instruments are used. The most characteristic instruments are the rihin (?? ), tihu and yahu (all two-stringed bowed lutes), the sanxian, pipa, ruan, guzheng, and yangqin. The number of instruments and performers in the ensemble is flexible and depends on the availability of instruments and musicians to play them - but to have an even and balanced texture only one of each instrument is preferred. Chaozhou drum music includes the big drum and gong, the small drum and gong, the dizi set drum and dong and su drum and gong ensembles. The current Chaozhou drum music is said to be similar to the form of the Drum and Wind Music of the Han and Tang Dynasties. The Chaozhou guzheng and erhu are also regarded as major members of the southern instrument family. The region is best known for originating Bak Kut Teh (??? ), loosely translated in dialect as Meat Bone Tea which is a popular dish with overseas Chinese Teochew community in Singapore and Malaysia. Owing to its coastal geography, Chaozhou is also famed for its seafood soups and porridge known as a Myueh. In 2006, GDP of the whole city totaled 33.0 billion yuan, up by 13% over the previous year. Agricultural output value reached 5.732 billion yuan, dropped by 3.1%. Industrial output value amounted to 64.9 billion yuan, representing an increase of 16.4%. Seven pillar industries of ceramics, garment, food, plastics, electronics, stainless steel products and printing achieved above-scale industrial output value of 22.92 billion yuan, up by 30.3%, accounting for 62.7% of the total above-scale industrial output value. The proportion of the three industries to the aggregate of GDP was 9.5:56.2:34.3 in 2006. Local financial revenue in the general budget increased to 1065 million yuan, up 23.2%. The gross value of import and export added to US$2.3 billion, representing an increase of 21.3%. Overall consumer product retail sales came to 11.814 billion yuan, representing an increase of 14.7%. Consumption on transport and telecommunication, garment, health care and housing showed massive growth. Expenditure reached 3.56 billion yuan for urban resident and 8.25 billion yuan for rural resident, showing rises of 11.1% and 16.4% respectively. Throughout the year, Chaozhou received visitors of 1,899,000 person/time, up by 15.6%, yielding a revenue of 2.748 billion yuan in tourism, up by 15.4%. Investment in fixed assets came to 10.974 billion yuan, up by 12.4%. Chaozhou is a famous historical and cultural city in the country. The citys feature is known as "Classic Tourist City" which receives numerous tourists both from abroad and home. 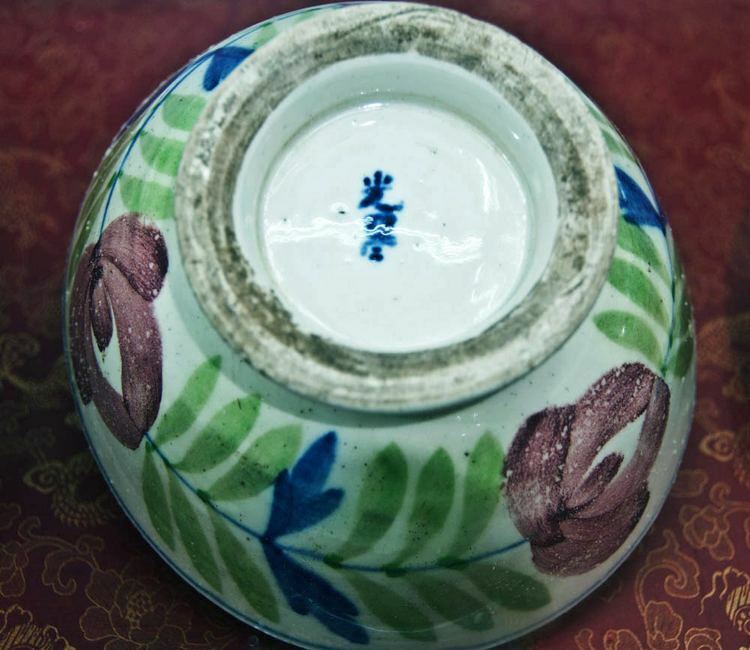 There are many valuable historic relics in Chaozhou city, totally about 600 units and among them 42 are classified as the state, provincial and citys key preservation units of cultural relics. The Chaozhou Dialect, Chaozhou Opera, Chaozhou Ganghu tea, etc. have unique features of Chaozhou culture, attracting numerous tourists from home and abroad, and are the richly endowed tourist resources. Beige Fodeng—The Lighthouse of Buddha (). The lighthouse was used for boats in the Han River as this part of the river was dangerous. The lighthouse could remind people that they were in Chaozhou area and ought to be careful. It is said a former emperor once passed in his "dragon boat" while he was sleeping and was woken by the light from this Lighthouse. He thought it must have been a bodhisattva sending him the light and therefore named it the "lighthouse of Buddha". Guangji Bridge, built in the Southern Song Dynasty (1170 A.D.). Huang Jilue Temple (), displaying the wood carving art of Chaozhou in the Qing Dynasty. The old site of Song Kiln, that shows the scale of production and the exquisite craftsmanship of ceramic in ancient Chaozhou. Jiadixiang (), the ancient family houses. 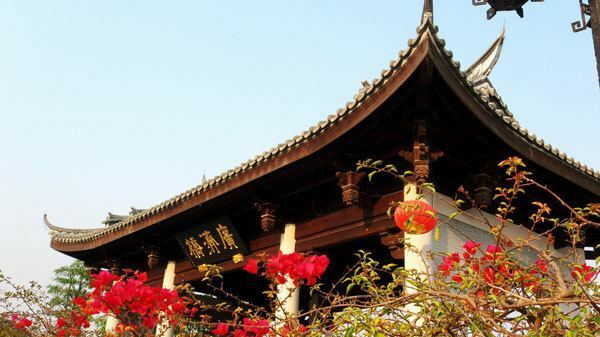 Kaiyuan Temple () is a Buddhist center embodied with the quintessence of the architectural art of various dynasties such as the Tang, the Song, the Yuan and the Qing. This temple is over 200 years old. 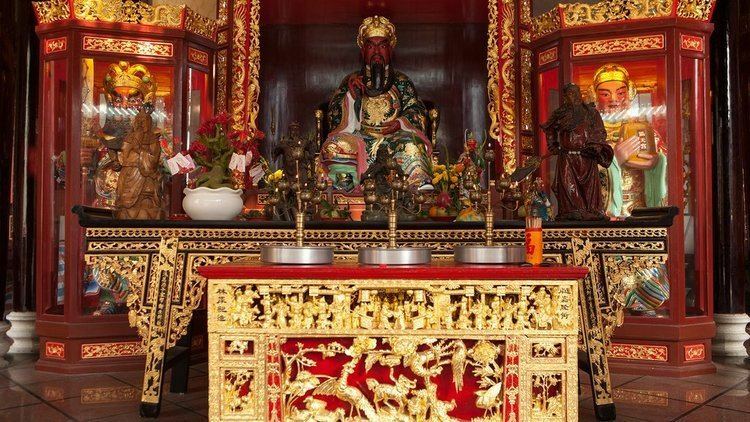 The temple is also home to the most influential Buddhism Study Institute in Southeast China. Inside, handsome calligraphy and inscribed steles remind visitors that this temple once functioned as the record keeper of the city. Night scene of the Peoples Square. The Ming city wall (), 2.6 kilometers long. Xu, Imperial Son-in-law, Mansion (), which retains the basic pattern of the architecture of the Song Dynasty. Xi Hu Yuan, a museum in the main city park, has a unique collection unique of stones with natural geological markings representing (or resembling) Chinese characters.